There are so many good things to say about pork chops. They’re not that expensive (compared to steak and fish). They’re considered ‘the other white meat’. And most of all, my entire family will eat them. I get kind of tired of the same old pork chop recipe. I’ve made them too many times either breaded and fried or baked in the oven. Because I was bored with them, I hadn’t made them in a long time. 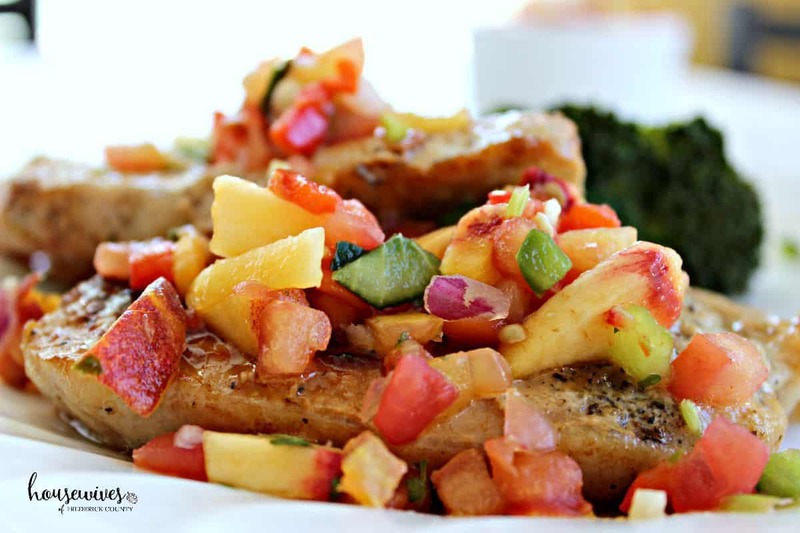 But one day I was flipping through my First for Women Magazine and I found a recipe for ‘Fruit-Kissed Pork Chops’. It sounded different and healthy. 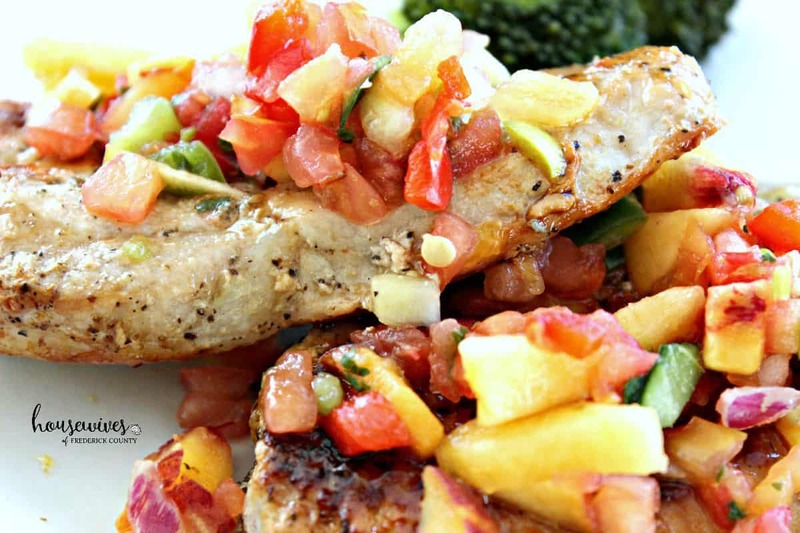 I decided to make the recipe but change the title to Peach Salsa Pork Chops. This recipe is extremely easy to make. I changed it up a little bit from the magazine’s recipe. Instead of grilling them on the grill, I pan sautéed them and used a little bit of olive oil. 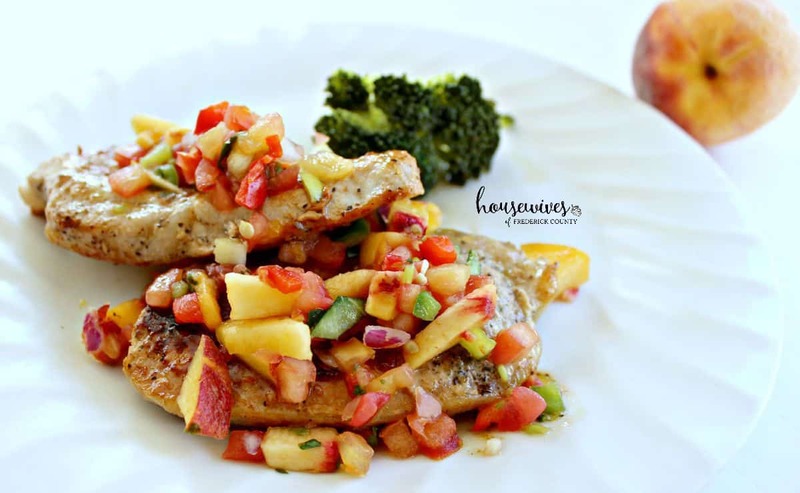 All you need are two peaches, a container of the fresh chopped salsa (from the refrigerated section at the grocery store, usually in the produce aisle), some peach preserves, honey mustard, and boneless pork chops. There’s something so wrong, but so right about combining flavors that are totally opposite of each other: salt & caramel, honey & mustard, bacon & donuts. 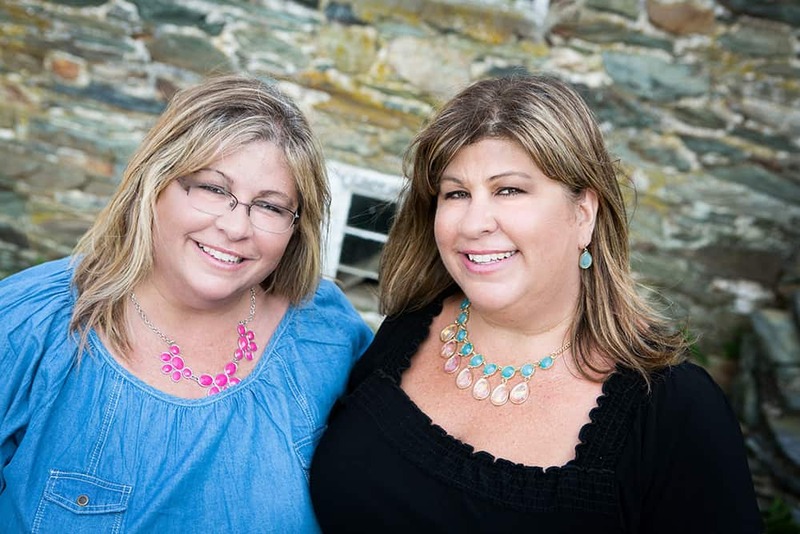 They’ve all sounded crazy at some point, but now they’re all the rage. The combo of peaches with a chopped tomato, onion, and green pepper salsa was very intriguing to me. As I expected, it was delicious. 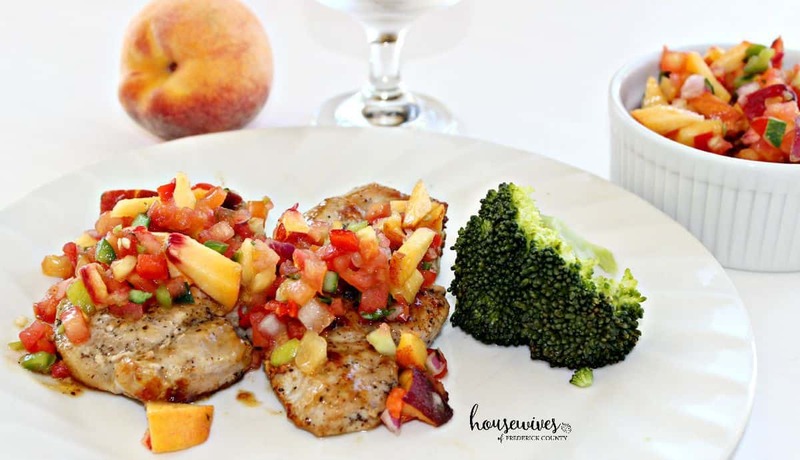 The honey mustard and peach preserves mixture is brushed onto both sides of the pan-sauteed pork chops. Then you add the peach salsa as a condiment on top. They were bursting with flavor. Add olive oil to frying pan and heat over medium heat. Season pork chops on both sides with salt & pepper. Sautee in pan for a total of 12 minutes (6 minutes on each side), or until pork chops are browned and cooked through. In a small bowl combine honey mustard and peach preserves. 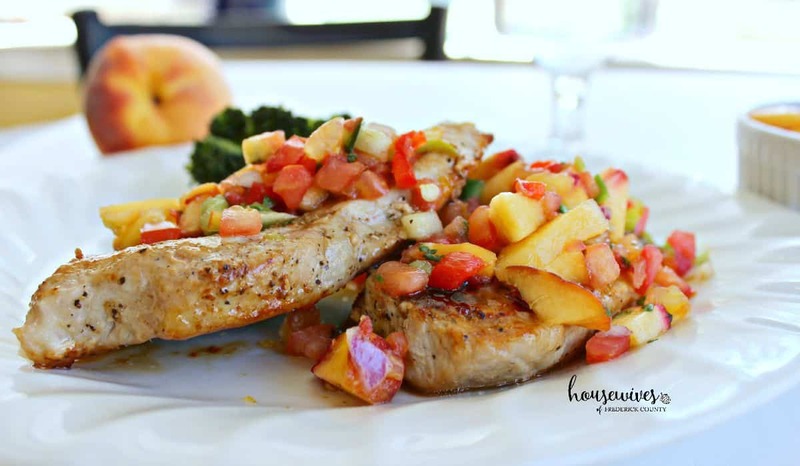 Remove pork chops from pan and brush all sides with honey mustard/peach preserves mixture. 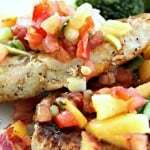 In a large bowl, combine prepared fresh salsa with fresh diced peaches. 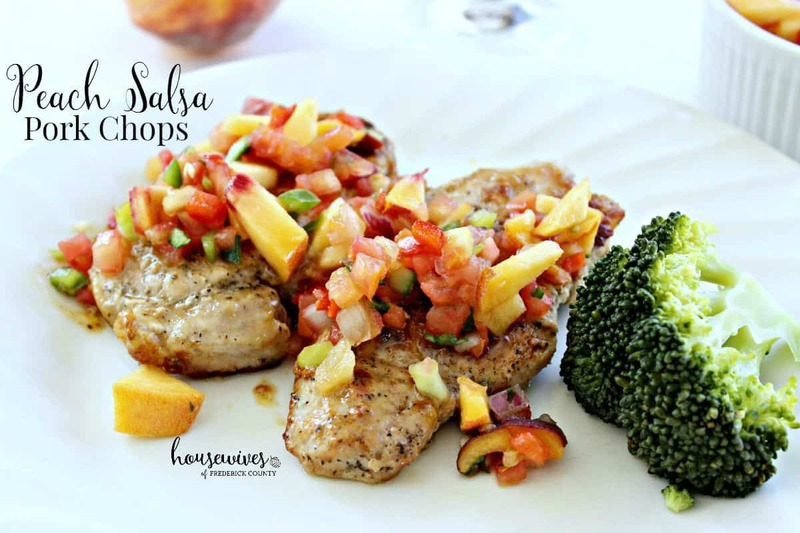 Serve salsa over pork chops. This recipe will definitely stay in the front of my recipe box! What are some of your favorite recipes that include ingredients that you wouldn’t expect to be paired together? Thanks Celeste! It’s super easy to make and really good!